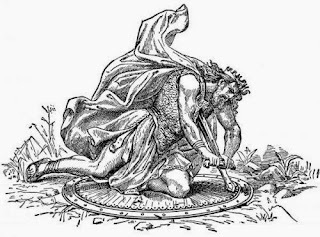 the end comes for two men in today's reading... Absalom's adviser gives him advice that he should have followed if he wanted to defeat David. but man makes His plans, while God orders his steps... so Absalom follows the other guy's advice, and his chief adviser goes home and hangs himself. sad, ignominious ending. Jesus, on the other hand, defeats sin.He conquers the enemy of temptation, and then He says "It is finished" and gives up His spirit. never has a man died like that in the history of the world. God, please order my steps to fulfill your plan, like you did with Your Son. we have a theme today, too. it is one of suffering. David has a heckler. some man is following him around, throwing rocks at him and calling him a murderer. instead of letting his men kill the guy, he tells them to leave him alone. "maybe God will see my suffering and bless me." then we come to Jesus. 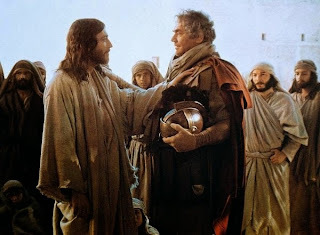 He tells Pilate that he would have no authority over Him if it hadn't been given to him. and then He is led away, beaten severely, and crucified. if the story ended there, it would be a terrible one. it would point to a blackness underneath of the happiness we see in the world. it would mean that when you peel back layers, you find darkness underneath. but this is not true. yes, there is actual, real suffering in this world. it's not an illusion. it's not a trick. suffering is real, it exists. and, as we see in today's readings, GOOD people suffer. suffering is not just the result of bad decisions (though it's often that, too). suffering is for those who haven't done anything to deserve it. but suffering isn't the end. the story doesn't end there. we will see what happens three days later in our readings over the next few days. but - SPOILER - this story has a happy ending. the happiest ending in the history of the world, and it's your ending, and mine. God, thank You for the suffering in my life, which brings me closer to You. and thank You that suffering is not the end of our story. it's nice when the readings all fit together. and today, they fit like lego pieces. the very last verse we read today ties it all together: man makes plans in his heart, but God determines his steps. 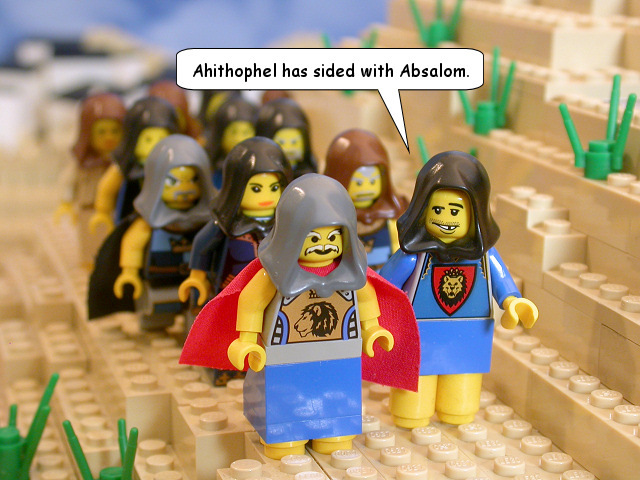 we see this in the OT reading... David brings Absalom back to Jerusalem, despite the fact that he knows there's danger there. Absalom usurps his power, making plans to be king... but that tree branch is waiting for him. in the NT reading, the villagers come for Jesus with their pitchforks and torches, and one might think that their plans (which they made in their hearts) are what run the show here. but Jesus changes all of that by simply speaking. "who are you looking for?" 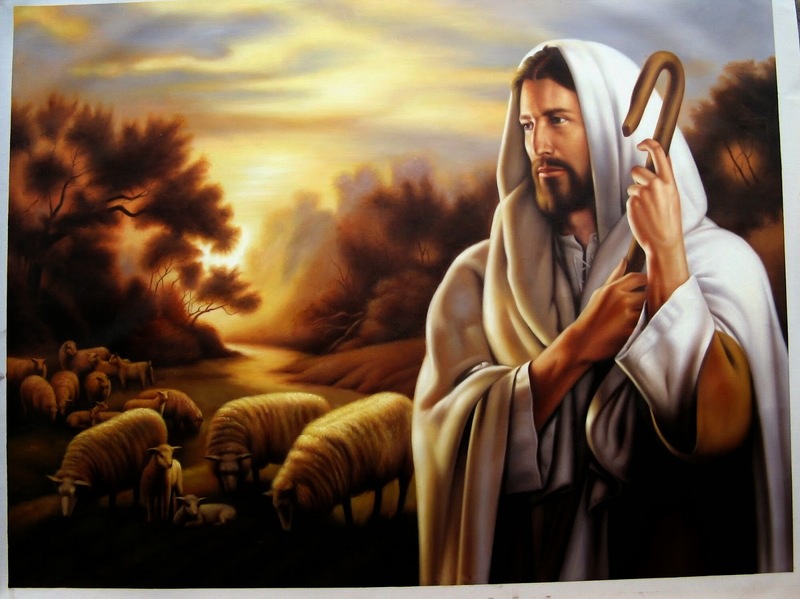 "Jesus of Nazareth" when Jesus speaks and says "I AM", this is God speaking... the same God that made the Heavens and the Earth... by speaking. they've caught a tiger by the tail, and they all fall to the ground, stunned at what has happened. but God's plan was that Jesus be crucified, for me and you. so He DID go with them, and they beat Him. we'll get to the rest in tomorrow's reading. but it all ties together. we make plans. God determines our steps. it's easy to see these things as being opposed to one another. to read it as "we make plans BUT God determines our steps." but... can't it also read "we make plans AND God determines our steps"? what if we learn to make our plans in accordance with His will? what if we aligned our desires with His? then we make our plans, and God orders our steps toward those plans. pretty cool, eh? when we pray "your will be done on earth (in my life) as it is in Heaven", we're praying exactly that. God, please make my plans agree with Your direction of my steps. poor Tamar... her half brother treats her like trash... and then is killed for it. it's one of those stories from the Bible that you KNOW no one made up... because it doesn't make anyone look too good, not even the heroes of the story. in the NT reading, Jesus prays for you. yes, YOU! He prays, of all things, that you will be one with all other believers. so, to me that seems to mean that it's pretty important to Him that we get along. don't you think? that's something we should probably pray regularly, and work towards. Jesus wants us to be one. so let's pray that His will be done on earth, and that we who call ourselves Christians will stop fighting and be one, as He and the Father are one. God, please help me to be a peacemaker, and to help your children to be one, as you desire. i love both the OT and NT reading today. David repents... and he begs God not to kill his son. but God does take his son, and he immediately gets up and worships God. that's faith. that's trust. and notice what he tells his servants... "i can't bring my son back... but I will go to him one day." 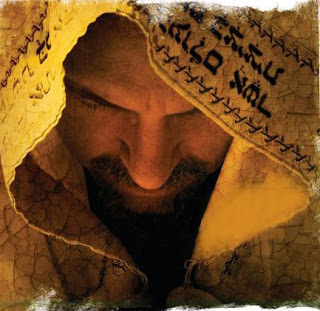 David is quite the amazing example, even when he sins, he shows us how to repent. and Jesus says one of my all time fav things today. it sums up our lives in one little verse. in this world, we will have trouble. but, my friends... take heart. 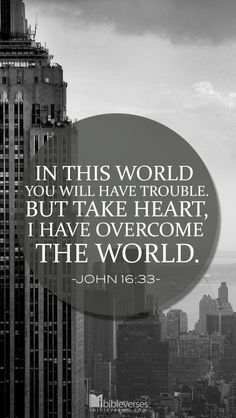 He has overcome the world. so much richness in that one little verse. and He tells His disciples, and us, that whatever we ask for, in His name, God will give us. so let's ask Him for boldness... and for direction... to pray for the things that need to happen in this world. let's ask for wisdom. let's ask for His presence in our lives. let's ask for His will to be done on earth, as it is in heaven. these are all things He will always say "yes" to. so let's ask! God, please give me wisdom and boldness to pray for the things you want to happen, in my life and in this world. so today, Jesus tells us about remaining in Him. 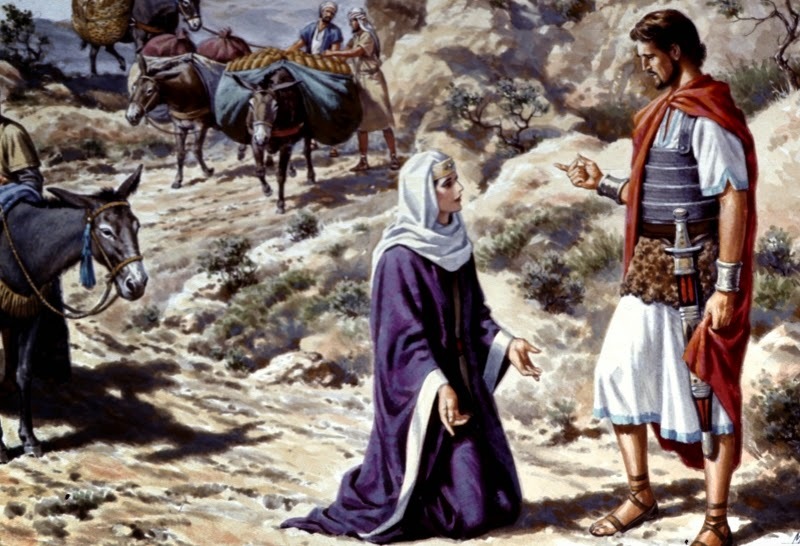 many of the things that Jesus said are difficult to understand... and He did that deliberately, so that only those close to Him would know what He was saying. so what do we do when we come across a verse and don't know what it means? how do i do that? well, the cool thing is that we can just ask. we try to make it way too hard sometimes... we think we have to figure it all out. but He wants to help us. of course He wants us to remain in Him, so that we will grow and not wither up and die. so if we ask Him to help us remain in Him, He will. if we ask Him to do the things He calls us to, He'll give us the desire to do it.. and He'll help us do it. the important thing is to ask. when you wonder what you should do? ask. that's why He tells us to pray without ceasing. spend time with Him, and ask. He'll help you do the rest. God, please help me do your will, even when I don't understand it. Jesus talks today about sending the Holy Spirit to His disciples... and tells them that He will be in them, in the form of the Holy Spirit... so He never left them at all. He says that only those who believe in Him can really see who He is. and that made me wonder... when He came back to life after He was crucified, could people who didn't believe in Him see Him? well, the answer actually did come to me. even some men who DID believe in Him didn't recognize Him... on the road to Damascus. but the more poignant lesson came shortly after... and came home. not only do those who don't believe in Him not recognize Him... not only did those disciples not recognize Him... but we fail to recognize Him today, even those of us who love Him. 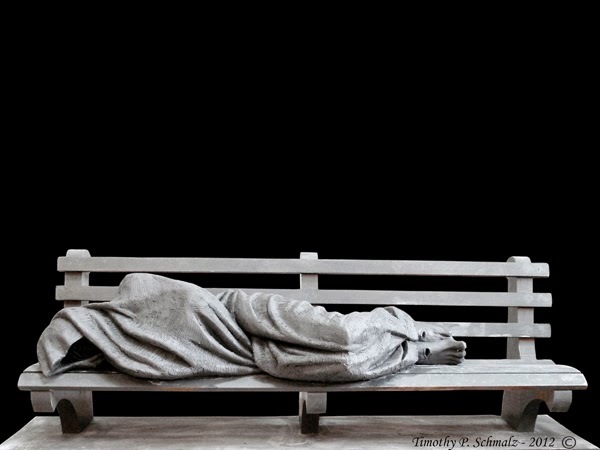 the picture above is a sculpture of "Homeless Jesus". God speaks to us in many ways.... through the Bible, through the church, through the wisdom of our brothers and sisters, through our conscience... and through the poor. the face of the poor is the face of Jesus, looking to us for our help, but also imparting to us His wisdom. what we do for the least of these, we do to Him. but the wisdom of suffering is something that can teach even the wisest something that can't be found in books. God, please open my eyes to your presence in my life... in all of its forms. Peter cracks me up today. but he does (again) what all of us silly human beings do to Jesus every day. Jesus tells His disciples that He's going away. and then He gives them the greatest commandment... He tells them to love. He tells them what we should all do, every day of our lives. Love God... love one another. and what does Peter say? "Yeah, yeah... but where are you going??" it seems so funny when you read it... but we do the same thing. Jesus tells us to love one another. and do we do that? not very well. we argue. we bicker. we fight. we pick and choose who gets to be loved... and who is too different or too sinful to receive our love. and what do we do instead? we get all worked up about the end of time.. about the rapture, about who is going to heaven, about eschatology.... when what Jesus is calling us to is very simple. He doesn't want us to figure out when the end of days is. He doesn't want us to argue about whether "meeting Him in the clouds" means we'll be raptured or not. what He wants... is for us to love one another. God, please overflow my heart with your love, so that i can't help but love my neighbor. poor Palti, son of Laish. 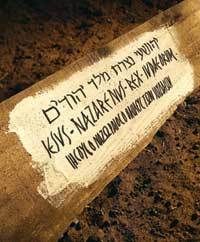 David did in fact win Michal's hand in marriage, but he had plenty of wives and concubines. Palti clearly loved Michal... you can tell by the fact that he follows her down the road, weeping, as she is taken from him and given back to David. who knows how they ended up together? who knows if Palti was a good man or a bad one? but what we do know, and i love how the Bible gives us such human stories to read and marvel at, is that Palti loved Michal. they told him to go home. and he did. but you can still, thousands of years later, see the look on poor Palti's face as he walked sadly home, heartbroken. thank You, God, for giving us these little stories of human lives... as it reminds us that our lives matter to You... even us little people. he had so much going for him. he was King of Israel, and David was making Israel a safe and happy place to be. but Saul was overcome with jealousy. he is a poster child for jealousy. he threw his whole life away and died a horrible, ignominious death due to jealousy. thankfully we have David to look to for a good example. he honors the place of the King, even when that King has gone mad with jealousy. there is a good lesson for us here. whether we hate Bush because we think he's stupid and greedy, or we hate Obama because we think he's evil and greedy, most of us strongly disagree with whoever we have in the office of the president from time to time. but as Christians, we are called to pray for that man, regardless of whether we agree with him or not. David had more reason than any of us for hating the King. at least the president hasn't threatened most of our lives. and David honored the King. let us pray for the president. God can do anything, after all. God, please fill my heart with your love, that i might pray for those with whom i disagree. in the OT reading today, we see a foretaste of Jesus's laborers parable. 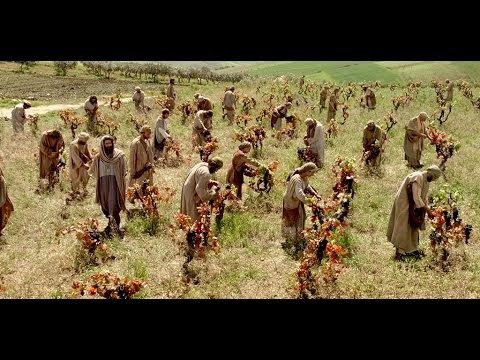 Jesus told the story of the men who were hired to go out into the fields and work at different times of the day, and then they all get paid the same wages. this seems unfair to those who worked longest, but Jesus points out that they can't fault the man who hired them just because he felt like being generous. David does something similar today. some of his army grows tired in their pursuit of the enemy, so they watch the equipment while the rest of the army chases down the enemy and kills them. they get all of their belongings back, and the men who fought don't want to share with the men who watched the equipment. but David tells them to share. this is a concept we should take to heart, because it tells us what the Kingdom of God will be like. God's generosity will extend to some mighty questionable characters. He will be bringing people into His kingdom that some of the holier folks will raise their eyebrows about. but His mercy is new every morning. and it's a good thing, because if He sees fit to let me into His kingdom, i'm sure i'll raise a few eyebrows myself. God, thank you for your mercy, foreshadowed in the OT, and brought to fruition in the New. i especially liked today's picture, so i made it extra large. lots of good reading today... David runs off and fights alongside the Philistines... only he tricks them and is killing off his enemies' towns one by one while the king thinks he's killing Israelites. the NT reading is one of my fav stories... Jesus raises Lazarus. the whole story is beautiful. very human, and very divine is Jesus in this story. but the verse that leapt out at me today was before Jesus goes to Judea... His disciples believe that if He goes back to Judea, He's going to be killed. but one of His disciples says "Let's go and die with Jesus." that is profound. he would rather die with Jesus than live without Him. because, over the last three years while walking with Jesus, he has come to realize that there is no such thing as living without Jesus. without Jesus, there is only death. Jesus is life. and He then goes on to SAY those very words to Martha. "I AM the resurrection and the Life. He who believes in Me, though he were dead, yet shall he live." we are called to make this same decision every day of our lives. we are called to go "die with Jesus." our sinful nature doesn't want to. but the better part of our nature, the wise part of us, realizes what that disciple did. there is no life apart from Him. 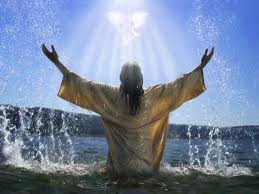 so let us, with that disciple, every day say the same... "You are the resurrection and the Life, Jesus. I'm going to come die with you, so that I'll live forever." God, let this be my daily experience. thanks be to God for sensible women. in today's reading, Nabal (whose name apparently suggests the word 'fool') and David get into a hot headed argument. and, right after sparing Saul's life in the cave, David marches off to kill Nabal and all of his family. but Abigail kept her wits about her, went and met David, and ... get this... TOOK RESPONSIBILITY for what had happened. she asked David not to do anything foolish. he thanks her for her sensible and wise response, and spares Nabal's life. Nabal gets the news that he almost got killed by David, and has a stroke and dies. then David very wisely marries Abigail. it's a pretty amazing story, and it reminds us what happens when we keep our head, do the right thing, and work for peace instead of violence. it doesn't always work out this great in the here and now, but it always works out for the best in the long run. God, please help me be a peacemaker. Saint Augustine famously asked God to make him a saint... "but not yet". in other words, he wanted to have a little fun before he was "made perfect". while we can certainly understand that sentiment, it's very foolish. there is part of us that really believes, along with Augustine, that life is more fun and interesting if we do bad things. and that it's boring and stifling if we become saints... if we live for God. but the opposite is true, as Jesus says today in the Gospel. the thief ONLY comes to steal, kill, and destroy. 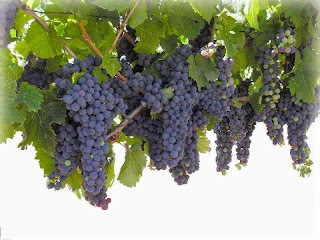 Jesus comes to give us life - and not just life, but abundant life! following Jesus makes us deeply happy. not the surface happiness that passes as soon as it comes... but the kind of abiding joy that makes us delighted for years. trust Him! He wants to make you happier than you can imagine. God, please help me choose You and your happiness over the passing phantasm that the enemy offers. 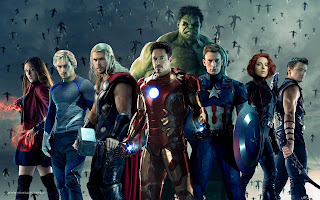 i saw the new Avengers movie tonight. it was good! laugh out loud funny in many places... good plot, interesting subplots... and some surprising revelations. my one complaint about the new superhero movies is that there is often SO MUCH going on at the same time, it's hard to enjoy it all. the director does a good job of focusing the viewer's eye on certain parts of the action. but i think i'll have to see this multiple times to catch it all. this is a great exploration of the idea of AI. i enjoyed how it played out in the plot, both for good and evil. i won't say more to save you from spoilers. i definitely recommend seeing this, and i suggest you see it on the big screen. it's a spectacle, and won't be as fun to watch on a small screen. PS james spader does a fantastic job as the voice of ultron... great voice acting. in today's reading, Jesus says that we should do what God wants for us right away, without delay. and many people wonder what God DOES want them to do. the only people who don't wonder this are people who don't care what God wants. because if you care what He wants, you will find yourself at some point wondering what it is. and many people think that figuring out what God wants is really difficult, and usually dread doing whatever it is. what they don't realize (and what took me years to find out) is that God wants you to know His will for your life. not only that, but it's something you'll enjoy doing. He gives us our gifts and talents and abilities... He is the reason why you like doing ABC and aren't really fond of doing XYZ. for me, i love reading, learning, writing, and telling people what i've learned. i don't like basketball. so, from that, i can probably determine that God wants me to read, learn, write, and share what i've learned. He wants me to use those gifts and desires for His glory, to help His kingdom. and here i am in this very blog, doing just that. He probably is NOT calling me to play basketball for a living. but it goes deeper than that. there are things that He is calling me to that i DO have to spend time thinking about and praying about. but it's not like He doesn't help us. think about it... don't you think God WANTS you to do His will? of course He does. so when you ASK Him to help you figure out what His will is for your life, that is a prayer that He will ALWAYS say yes to. always. so you can pray in confidence, knowing that God is going to answer your prayer with a "yes". isn't that a great feeling? 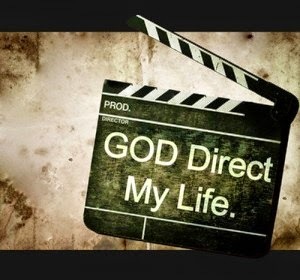 every day, i try to ask God to show me what He wants me to do. and then He does, and He helps me do it. not only does He show me His will, He gives me the desire to do it, and He helps me do it. it's pretty awesome. so i encourage you to ask Him. what do you want me to do today, God? what should i do with my life? start moving in that direction... and you'll be amazed what He can do with you. thank You, God, for Your calling in my life. so much goodness in today's readings! the OT is full of Saul/David jealousy... which just shows how counterproductive jealousy is. if Saul had partnered WITH David instead of feeling threatened BY David, how much more could they have accomplished, rather than chasing each other around caves trying to kill each other? even the proverb was great today... the fool feeds on garbage. which is a pretty serious indictment of today's culture. but the really powerful verse is in the Gospel. i adore John, he's by far my fav Bible author. and today's verse is the very clear answer to any naysayer who tries to claim that Jesus never said He was God. you have to completely discount this Gospel (in which case, what are you building your worldview on about Jesus?) in order to continue believing that Jesus never said He was God. "Before Abraham was... 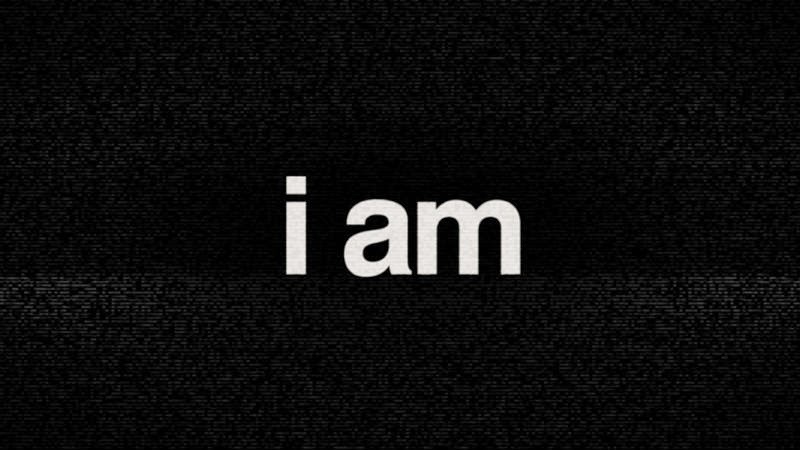 I AM!" it doesn't get much clearer than that. and this plunges us into the mystery of Jesus. He WAS indeed a man who lived about 2000 years ago. 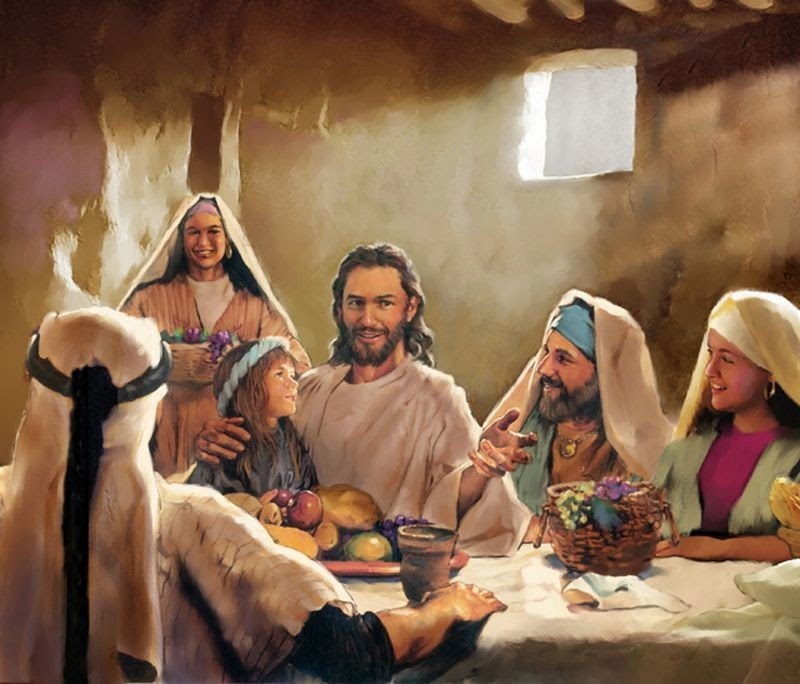 He was born of a woman and ate food and used the bathroom and suffered cold and was tempted to sin, just like us. but... He also was, and is, and is to come. He is the eternal God that is closer to us than our breath. this can be a scary thought... that Jesus is closer to us than our breath. but let's learn from Saul's example of what NOT to do. Jesus is here with us. rather than feeling threatened... let's cooperate. let's love Him. let's see what we can do in our lives when we participate with Jesus. thank you, God, for being closer to me than my breath. please help me cooperate with Your work in my life. 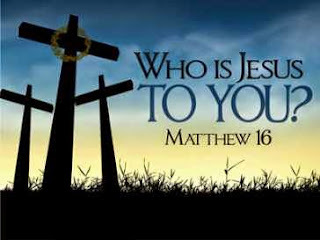 today the people ask Jesus the most important question in the history of the world. they ask Him "who are You??" that's a question we have to answer, each of us, in our lives. who is Jesus? and we don't have to just answer it once. we have to answer that question every day. is Jesus my God today? or is He just someone I used to know? someone that I once loved, but isn't so important to me anymore? am I showing by my priorities and by my actions that He is the most important person in my life? obviously the answer to that question will sometimes be no. there will be days that He ISN'T the most important thing in our lives. when we put ourselves first. but it only takes one little prayer to get things back the way they should be. as a very wise person recently said, God never gets tired of forgiving us. may we never get tired of asking, so we can put Him first in our lives again. God, please forgive me of my sins, and please help me to put you first every day. 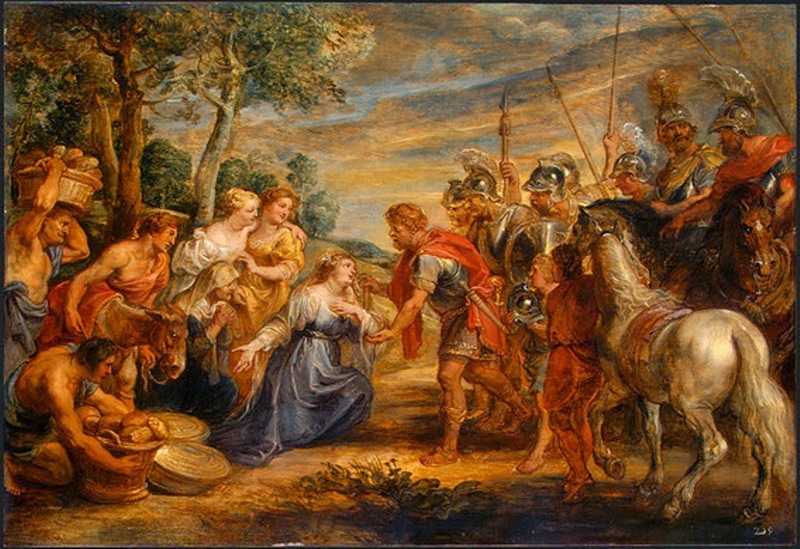 the woman caught in adultery. the question always arises... where is the man with whom she was committing adultery? but we know the answer... in the patriarchal society, it was the woman who was blamed. but the wisdom found here is after Jesus says that he who has no sin can throw the first stone to kill her. i never noticed this before, but the gospel says that they all slipped away, beginning with the oldest. those older guys realized immediately that they had no ground to stand on. and after they left, even the younger and less wise among them realized that as well. how we need to take this to heart! because we are all on our knees before Jesus, having been caught sinning. we are all in the crowd, looking down our noses at someone who has sinned, even though there is sin in our hearts as well. we all need His forgiveness, and blessed are those who realize it sooner rather than later. woe to those who never realize they need His forgiveness. thank you, God, for forgiving my sins. and thanks for the memories that keep me humble. 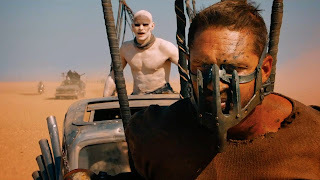 mad max is a mixed bag. the visuals are amazing... especially the sandstorm. but the director messes this up over and over by moving the camera around too much and too fast. 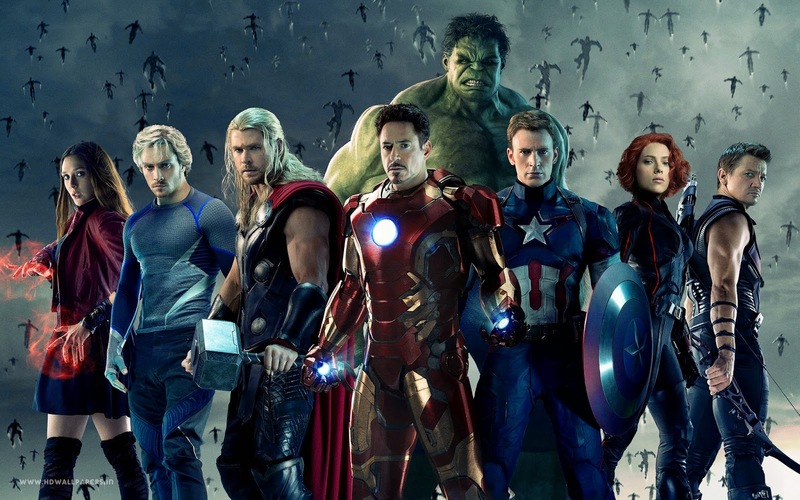 if we could have looked at some of the scenes and some of the characters, it would have made a better movie. but it's so fast from one glimpse of one thing to another that you can never drink it in. tom hardy is a terrible choice for max. he doesn't have the charisma, charm, or presence to carry off the part. he grunts and mumbles his way through his lines, and looks thoroughly bewildered for most of the movie. they needed a stronger actor in the role.... a harrison ford or mel gibson or daniel craig... anyone who can connect with the audience. it was hard to care about the movie because there was no focal point. there were a few really good performances. nicholas hoult and rosie hungtington-whitely both perform very well and, despite the director's best efforts, do connect with the audience and make their scenes worth watching. overall the film is remarkable just for its pyrotechnics. there are some cool effects several times, with explosions and the ever present dirt that makes everything look cooler. but i would call this a disappointment. i was hoping it would be really good... it was just fair. Jesus stands and shouts to the people "Anyone who is thirsty, come and get free living water that will flow from your heart." 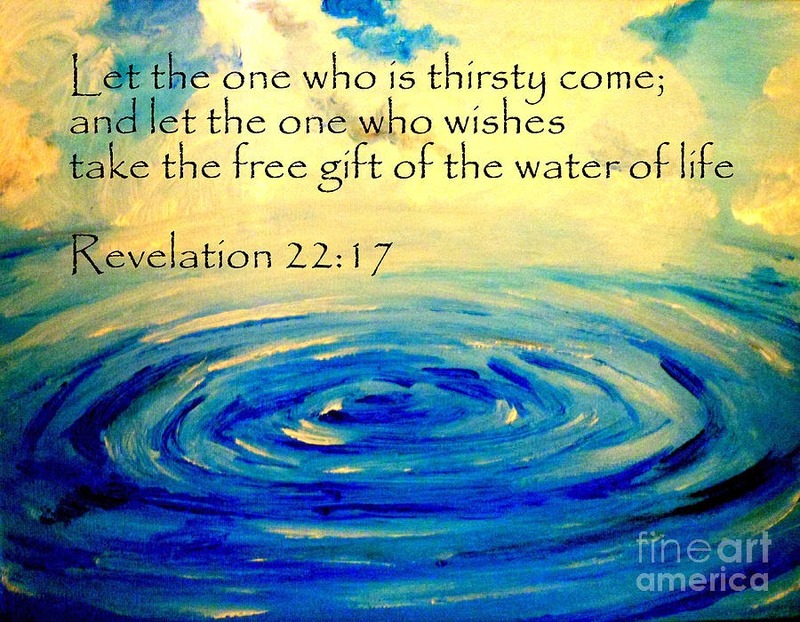 like the woman at the well, i say to Jesus (and from a place of sinfulness, as well) "give me this living water"
and He does. He pours out His living water into our hearts, every day if we ask. 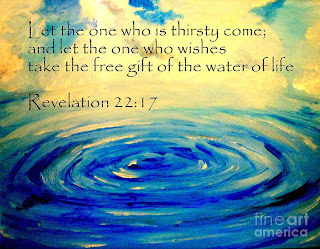 we just have to leave our pride behind, and trust in Him, and open our hearts... and receive His living water. God, please continue pouring your never ending stream of living water into my soul. in today's readings, we see Jesus talking to His relatives. 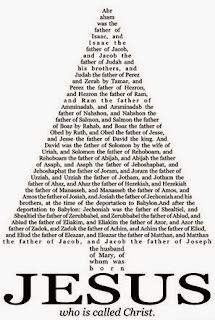 many Bible translations call these men His brothers, and some Christian groups use this verse to try to prove that Mary had other children besides Jesus, that she was not a virgin for life. 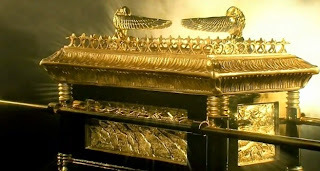 now, i'm not going to try to make a case either way here, as the point of these blogs is not to try to convince either group that they're wrong, or to try to get one group of believers to change and believe what the other group does. i want people from all backgrounds to be able to read and enjoy these Bible reflections. but i must clarify something regarding this issue. these men were not Jesus's brothers. we know for sure, as Christians, that these men were related to Jesus, because the Bible uses a word to describe them that clearly means they are related to Jesus. but as Christians, we also know that these men were not His brothers. how do we know that? well... if my mom had another son, but not by my dad, would he be my brother? no. he'd be my step-brother. so whatever these men are to Jesus, they are not brothers. we have to decide what they are, and some Christians believe that they are cousins, since they believe that Mary never had any other children. some believe that they are Mary's other sons. but let's be clear... whatever they are to Jesus, they're not brothers. 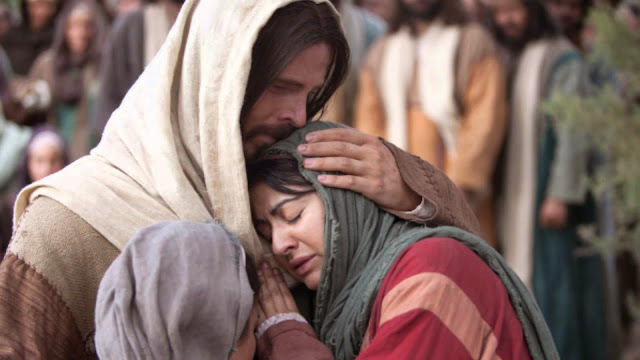 however we relate to Jesus and His mother, though, let's always remember to do it in love. after all, we are all part of the Body of Christ, and He doesn't want us to fight. God, thank you for making us part of Your family. please help us get along. some passages from the Bible are hard to understand. 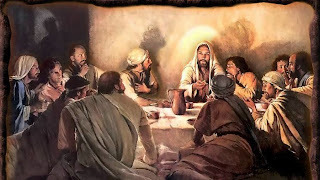 Jesus saying that we are going to eat His flesh and drink His blood. the reading from the Psalms where God causes things to go wrong in people's lives so they'll call on Him. 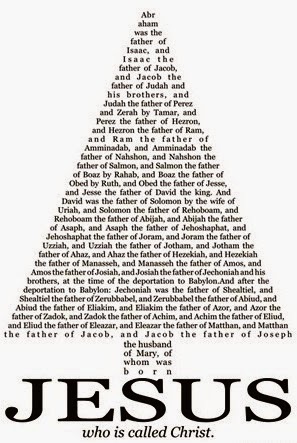 but one tiny and enormous fact unlocks these verses... and the entire Bible. God loves us. it's hard to grasp. but God, the creator of everything, loves each of us with a deep, passionate, powerful love. He deeply desires for us to love Him back. He is the passionate lover in all of the love stories you've ever read... and more. He is the original lover. He is primordial love. all of the loves of all time only point to the love that God has for us. and He very desperately, painfully wants us to love Him back. He even commands it! our greatest commandment is to love God with all of our heart, mind, soul, and strength. He is up there.. out there... everywhere... and He's saying "I love you so much. Love me...."
when you realize this, everything in the Bible makes sense. it's just different stories, different examples, all pointing to how much God loves us and how much He wants us to love Him back. please grow my love for You, God. You are amazing. Jesus says some things in John 6 that make many people scratch their heads. He says He's the bread of life, come down from heaven. 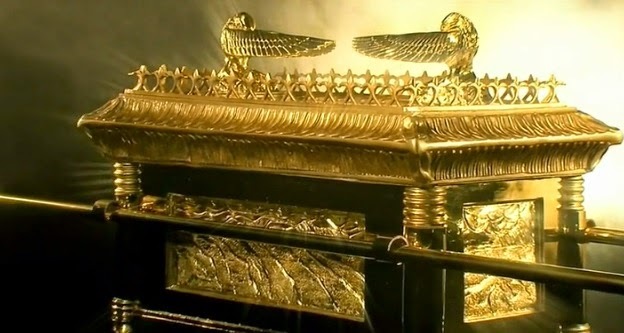 an interesting thing is that the people who heard Him say that had a harder time with the idea of Him "coming down from heaven" than they did with Him being "the bread of life". but they did. they said to themselves "isn't this Joseph's son? how can he say he 'came down from heaven'?" you can see they were confused as to His identity. they thought Joseph was His dad. and so they didn't understand that He had, in fact, come from heaven. so the confusion goes all the way back to when Jesus was actually walking the earth 2000 years ago. people today still get confused. they still think He was just a man, born of another man, and that He said and did some nice things, but that was about it. the idea that He was born of a virgin, led a sinless life, and then died, defeated death, and rose again to eternal life is, needless to say, difficult for them to accept. but let's have patience with those people. for one thing, they're us. we all have trouble accepting things that Jesus tells us. we all struggle with our faith from time to time. we all need patience. for another thing, being patient with them will do a whole lot more to help them come to believe than pointing out their doubt and thinking that we're better than they are. thanks for the things i struggle with, God. those things keep me humble. during Jesus's three years of ministry, He raised people from the dead. that seems like it would be the most amazing miracle you can perform. and i suppose it is. but for some reason, my brain has the most difficult time understanding the two miracles He performs in today's readings. first, He miraculously feeds 5000 people with just a little food. my brain wants to see how it happened. did He just keep tearing bits off, and it never got any smaller? Or did He just keep handing fish and bread to His disciples and they never ran out? i wish i'd been there so i could see how it happened. 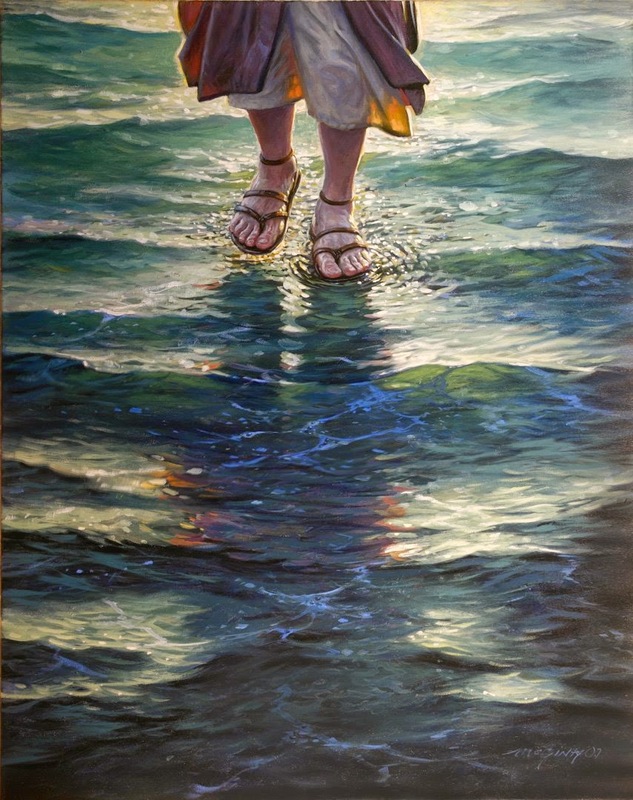 and then He walks on water. i also wonder what that looked like. did He go up and down with the waves? or did it look like He was walking on something under the water and the waves went up and down around His ankles? but the take home lesson for me today was that the disciples were in the middle of a raging storm. they were desperate, and thought they might die. Jesus comes to them in the middle of their desperation... and the part of the story that is also amazing, but vaguely familiar, is that John records that as soon as Jesus got into the boat, they were suddenly at their destination! this sounds familiar because it echoes what happens in my life when i'm struggling. everything seems far away and impossible. everything is so hard, and it seems like i'll never get done with it all. and then Jesus comes, in the middle of my struggle... and not only am i no longer afraid of dying... but suddenly everything is done! thank You, God, for Your miracles. and thank You for meeting me in my storm. our reading today includes the scene you probably remember where God speaks to Samuel during the night and he thinks it's Eli speaking, so he runs to him. Eli finally realizes what's happening, and gives Samuel some very good advice: when God speaks to you again, say "Speak, Lord, for your servant is listening." God speaks to us, too. every day. He speaks to us in the beauty of creation. He speaks to us in the needs of the poor. He speaks to us in the Bible, in these readings. He speaks to us in the love of our friends and family. and He speaks to us in the difficulties of our lives. let's take Eli's advice. let's open our ears, and say "Speak, Lord, for your servant is listening." and then we'll be amazed at what He tells us... and we may have to ask for courage to do what He says. but He'll give you that, too. today we read about Hannah and her faith. she, like so many, wanted a child desperately. and God heard her cry. it never ceases to amaze me that He really does listen to us. but He does. He heard Hannah's requests for a child. and He blessed her with Samuel. 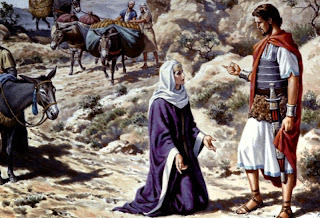 she returned Samuel to the LORD... and he became His servant for all of his life. and from a very early age, God spoke to him. we have an opportunity to be God's, too. He hears our prayers. if we ask Him to bless us with children, He will hear our prayer. 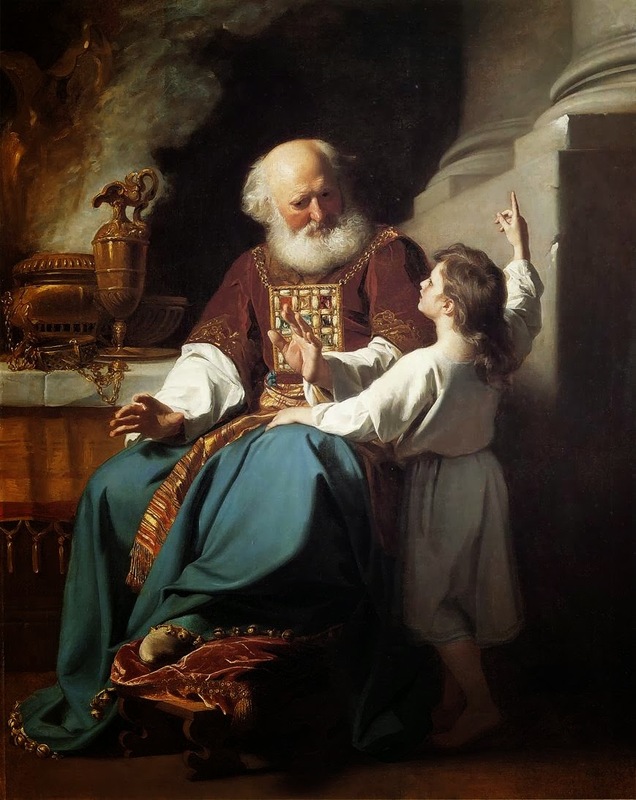 if we ask to be His children, to belong to Him like Samuel did, not only will He hear our prayer, but you can be absolutely certain that He will say yes. that's what He wants for you more than anything else in this world. He wants you to be His. God, please continually call me to be Yours, because that's where I belong. today we have two great readings. the story of Ruth is so heartwarming and beautiful. i can feel her excitement as she goes back to tell Naomi what Boaz told her in his fields, even reading it thousands of years later. but the story from the NT still outshines. and it surprised me. 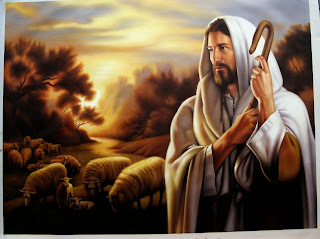 i remember the story where Jesus says that a prophet is not honored in His hometown... but in today's readings, He is! but the Roman comes and asks Jesus to heal his son. and Jesus says "how many miracles do you have to see before you'll believe in me?" and the Roman says, "Yeah, I know right? But while we're talking about that... do you think you could heal my son?" and Jesus just says the word, and he's healed that moment. Jesus looks at us and asks the same thing. how many miracles do we have to see before we trust Him? God, please help me trust you and be one of those who are blessed because I believe without having to see for myself. 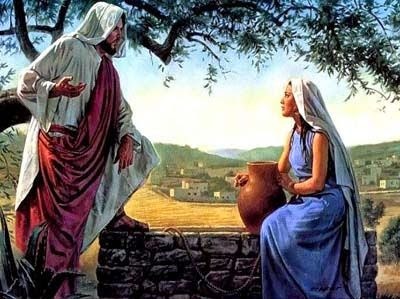 in case you never noticed... the first time that Jesus reveals who He is... it's to a Samaritan woman who seems to be living with a man who isn't her husband after being married five times. that's pretty shocking... but it's also very reassuring. you see... we all struggle with sin. and most of us struggle with sexual sin from time to time. our sexuality is a great gift. but it's a powerful good thing that is so very easy to cause us to stumble. it's part of the human condition to face this temptation, and many of us face it on a daily basis. but God is rich in mercy and forgiveness. we can't fall down more times than He will pick us up. He knows that we struggle. and He is so loving and forgiving... even when we're in the midst of sin, He comes and shares Himself with us and helps us to be whole again. thank You, God, for having mercy on a sinner like me. John says something interesting about Jesus today. he said "He speaks God's words, for God gives Him the Spirit without limit." the Spirit without limit. how do we limit how much Spirit God gives us? i think we can all answer that pretty easily. fear... sin... selfishness... it's easy to limit how much Spirit God can give us. but let's pray that we limit Him less. we know that it would be good to be more full of His Spirit. that's one prayer that you KNOW He will give a "yes" answer to. God, please take away my limitations and fill me with more of Your Spirit. 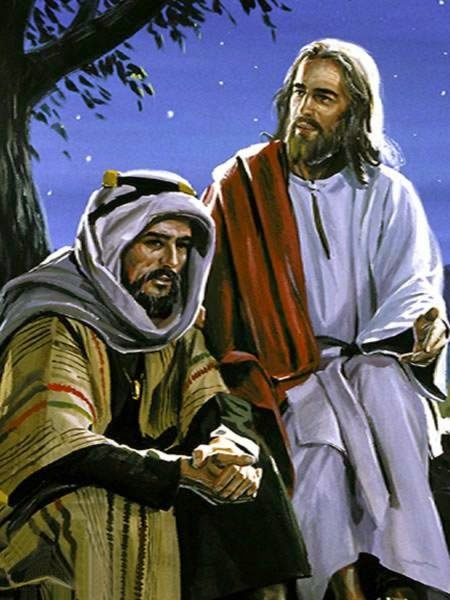 Nicodemus met with Jesus at night for fear of the Jews. this sounds cowardly, but when one considers that the Jews were plotting to kill Jesus and Lazarus. so this was no idle danger... it was fear for his life. what Jesus says to him is both perplexing and amazing. He says we must be born again. this is so contrary to logic that it seems designed to be contrary to logic. it requires radical trust in Jesus's wisdom. so many parts of our lives are the same way... designed to put us in a position where we HAVE to trust Him. God, please help my faith to grow so that I can trust you when life doesn't make sense. so in today's Gospel, it says that the people began to trust in Jesus, but that He didn't trust us because He knew what was in the hearts of men. herein lies wisdom. we need to learn to do the same. to trust Jesus with our lives and our treasure... and not to trust ourselves. don't we know what's in our own hearts? haven't we demonstrated that we can't trust ourselves? God, please teach me to put my trust where it belongs... in You. the mark of a real, and true life is one that invites you to come experience it. if it bears up to your intense, daily scrutiny... then it must be true. 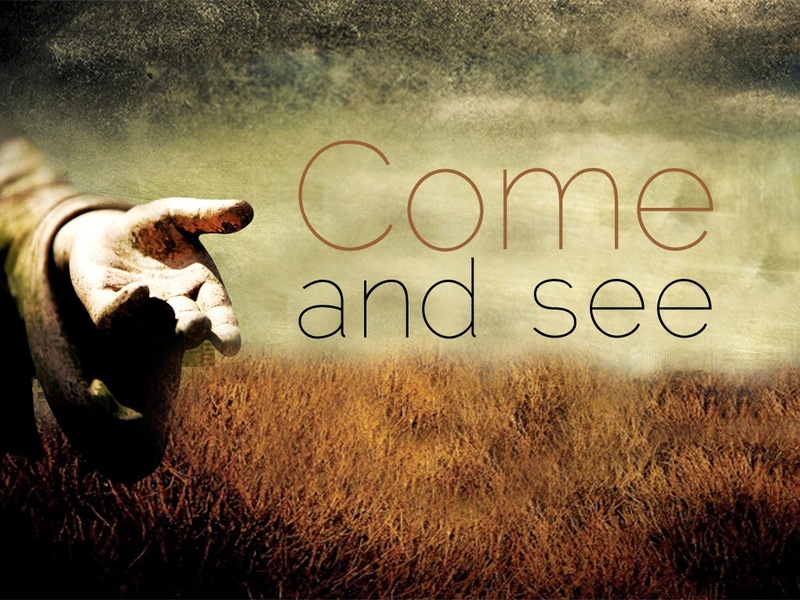 Jesus invited His first disciples to "come and see". come, walk with me. live with me. walk in my shoes. experience my life. see if this is what you're looking for. God, please help me to "come and see" what you have for me... because when I do: I'll want it for life. John is by far my favorite. he's a poet, and he writes about love more than anything. 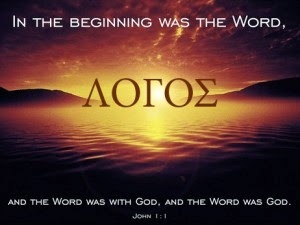 i love the way the gospel of John starts off... in the beginning was the Word, and the Word was with God, and the Word was God. not only is it beautiful and simple, very zen in its feel and profundity, but it is very deep and philosophical as well. John is here tapping into the idea of logos, which was a concept that Plato and his teacher Socrates used to point to a creator. just reading these words makes me want to be a better person. just meditating on John's gospel (and his epistles, btw) make me leave my sin and my selfishness behind... not dropping them around me to so easily entangle my feet again (as they do so often) but rising above them... living on a different plane, where it's not about me getting my way versus other people getting theirs... but it's about my deciding to serve and help others, so no one is taking advantage of anyone else. God, thank you for the inspiring words of your servant John, who helps me live on another level... closer to Yours.